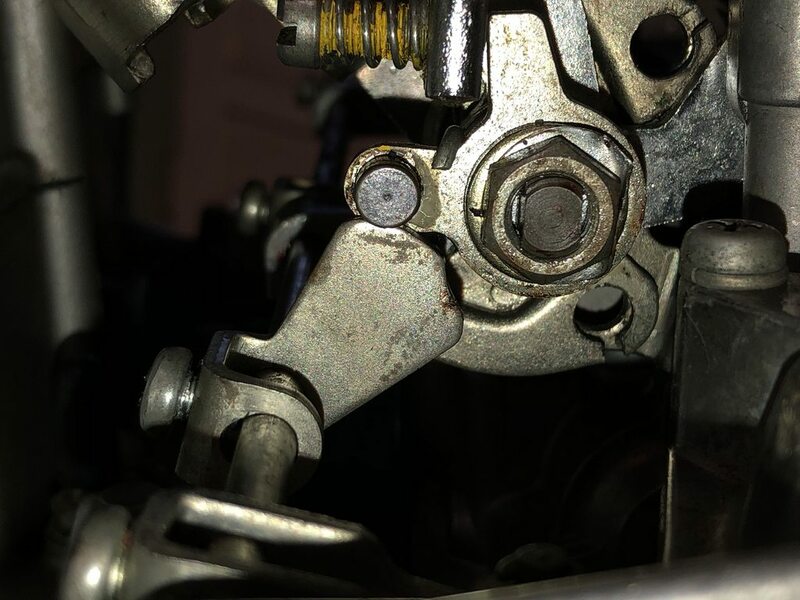 Hi all, small issue on my '79. When I open the throttle and release it to close, the throttle doesn't close all the way. I have to remember to twist the throttle closed manually, or else the bike idles at 3000-4000rpm, and brakes poorly because it's still trying to accelerate. So I pulled the tank off tonight and believe I've found the problem. 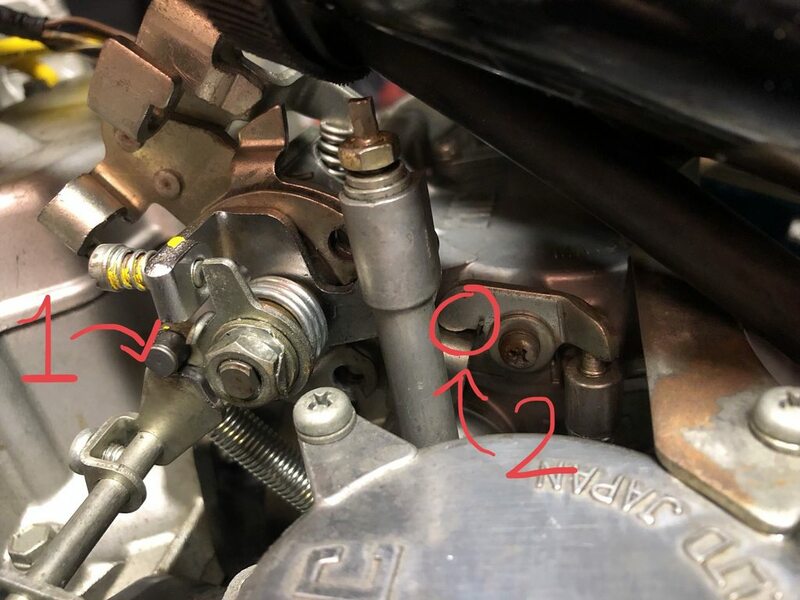 When the throttle closes, the little roller (I'm gonna call it the "choke roller" for lack of a better term), shown by #1 in the photo below, comes into contact with it's stop before the actual throttle stop (#2) can contact at the back. The throttle can be easily manually closed past this point, but I shouldn't have to do that. Could anyone direct me to information on adjusting this? I can't seem to find anything, and there's no apparent adjustment for the choke roller. Edit// disregard the "helper" return spring and the loose balance adjustment nuts. I added the spring to see if it helped (it doesn't) and was rechecking my carb balance. Slide the choke-roller cam out of the way and see if the idle returns to normal. I'll elaborate based on the answer. It's likely due to some assembly errors/ misalignments which are easy to miss. scotch wrote: Slide the choke-roller cam out of the way and see if the idle returns to normal. I'll elaborate based on the answer. It's likely due to some assembly errors/ misalignments which are easy to miss. Yes, with that cam out of the way, the throttle closes as it should. If I so much as loosen the set screw for that cam by 1/8 turn, the throttle works as it should. I didn't split the carbs off the rack when I cleaned them. Maybe I was hamfisted and bent something? I'm looking at the choke cam and the profile doesn't look right. It appears to be teepee'd. Scotch? Better pic. Thankyou. I'll leave this For Scotch to advise. He's our carb guru.